Nest house is a new hostel which opened in 2005, we are located in one of the most beautiful streets of Valencia. The traditional historical appearance of the facade has been maintained, while creating a 70's Pop design interior in our huge rooms with lots of natural light. We have designed the hostel to have the maximum facilities for you. We are only working with independent travellers so the Nest will be a great meeting point for backpackers from all around the world, you can share experiences in the friendly atmosphere we have created. We have a superb 2 station kitchen with microwaves, kettles and all the equipment you will need, next to it a dinning area for 40 people. As well we offer three work stations with Internet access next to our information corner. Feel free to use our laundry and dryers on our terrace. Don't miss our top floor where you can chill out and have a game of pool, drink a beer or two, listen to music, watch the TV or a DVD. Our central location makes us the ideal starting point for short walks to many of Valencia's most interesting sites. We will provide you with all the information you need to enjoy our city and country. Our young and experienced staff will ensure your stay in Valencia is unforgettable. 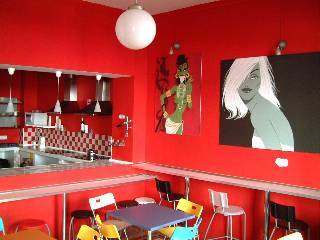 PLEASE NOTE: DUE TO THE RED NEST BEING CLOSED FOR ALTERATIONS FROM 1ST OF NOVEMBER TO 14TH OF DECEMBER 2006, BOOKINGS MADE FOR THIS PERIOD WILL AUTOMATICALLY BE REALLOCATED IN OUR SISTER HOSTEL, THE PURPLE NEST. Cancellations can be done without charging until 24 hs. before arrival and must be communicated directly to Nest Youth Hostel. In case of no-show we charge the 1st night of the reservation. Nest Youth Hostel reserves the right to cancel any reservation that might be related with any illegal immigration purpose to Spain. Valencia airport is situated only 8. 5 km from the city centre there are buses from the airport to Valencia every 25 min, they take you to Valencian bus station. Taxi from the airport to the city can cost you around 14 euros on a quiet hour, can double up on busy time due to traffic problems.